Are you searching for Faculty Teachers Kerala 2019? 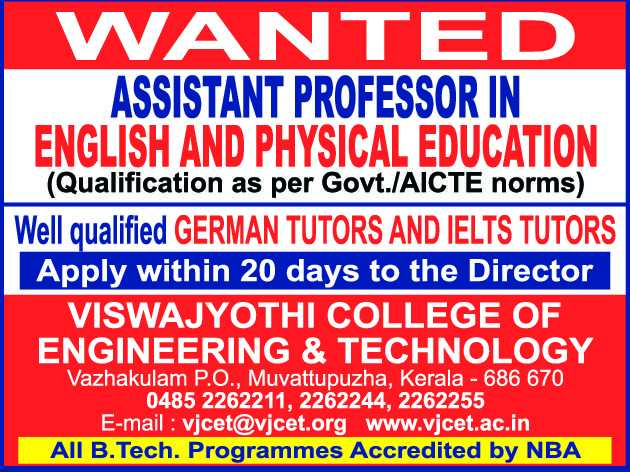 A college based in Ernakulam named Viswajyothi College of Engineering and Technology (VJCET), Ernakulam has advertised in THE HINDU newspaper for recruitment of Assistant Professor / Tutors jobs vacancies. Interested and eligible job aspirants are requested to apply within 20 days from 13th February 2019. Check out further more details below. About College : Viswajyothi College of Engineering and Technology (VJCET)TM is a private self financing Engineering College, established in 2001 and run by the Catholic Diocese of Kothamangalam. 'Service of GOD through service of Humanity' is the driving motto of the Kothamangalam Diocese. The Kothamangalam Diocese always has been in the forefront in serving the society and the cause of education for the last 5 decades with 90 schools, 3 Affiliated Colleges and 3 other Technical Institutions under its management. How to Apply: Interested and eligible candidates are requested to send applications along with CV and copies of supporting documents of certificates and experience & PP size photos to the following postal address or email address.